1. Boil one packet of vermicelli in hot water for one minute. 2. Then take it out of water. 3. Heat ghee in a pan till it starts giving crackling sound, now add vermicelli to it. 4. After frying it for one to two minutes, add khoya and fresh cream. 5. Fry again for one to two minutes. 6. Unify khoya and cream well after frying. 7. Now add sugar and cardamom powder to it. 8. After cooking it for a few minutes, add thinly chopped pistachios, almonds and kewra essence. 9. 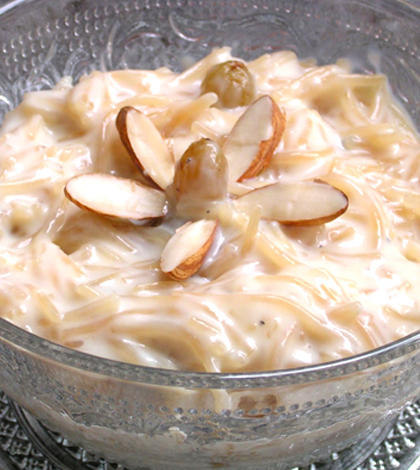 Your delicious Khoya Vermicelli is ready,milk is not used in it. 10. Garnish with chopped almonds, walnuts and fresh cream. 11. Chef’s tip: A little saffron can also be used to improve fragrance and flavour.